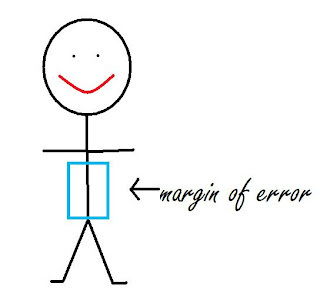 Take a walk with me if you will... Today's topic is all about the "Margin of Error" Which you can read in detail here, or you can just accept my explanation which is as follows... The smaller "X"= the bigger the margin of error. Let's apply this theory to the fashion world, yes? The smaller the person, the bigger the margin of error. 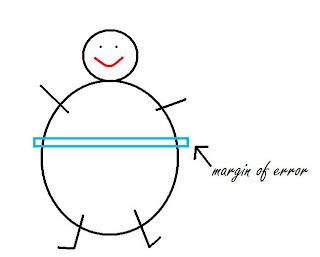 See, a thin person has a larger margin of error as far as clothing goes. Your pants can be a little lower, your shirt a little higher. Heck, you could walk around in a bikini and no one would mind much. 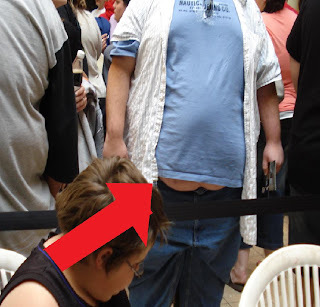 A larger person has a smaller margin of error. Your pants need to be higher and your shirts need to be lower, thus preventing any sightings of belly or bottom. Because let's face it, I don't want to see Figure B. walking around in a bikini. Thank you. Fashion Tips courtesy of MomBabe.